Tapping into a niche market for organic cocoa, some Peruvian farmers have turned away from cocaine in favor of growing beans for high-end chocolate retailers in Europe and the US. 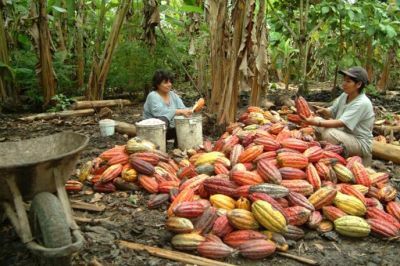 On the island of Pongo in Chazuta, a remote jungle area in the San Martin region in northeastern Peru, two former cocalero women cut open cacao pods for the sun-drying process to prepare the beans for organic chocolate production. The US government, via USAID, has assisted nearly 64,000 farm families to produce legal crops since its Alternative Development Program began in Peru in 2002. Today, more than 15,000 hectares of coca have been voluntarily eradicated by communities joining the program, making it a key component of the U.S.’s counter-narcotics strategy in the country.